Exquisite interior designed in pale hues and natural stone floors. Plenty of room for all with various sitting areas. For those who like action, there's the tennis court, swimming pool not forgetting the pingpong. Amazing contemporary barn with wonderfully spacious rooms and lovely views over traditional hop gardens and farmland, this fabulous building will make a breathtaking place to celebrate that special family occasion. With light and airy accommodation on two floors, double height ceilings, designer lighting and oak flooring, it really is a special place to stay. There is a private outdoor heated swimming pool, a tennis court and lots of space for all, with a particular feature being the first floor balcony that leads straight from the main reception area, providing stunning views over the surrounding countryside. If you are looking for a really special location, look no further you will not be disappointed! Watch Finchcocks Oast - The Kilns on Channel 4, The Restoration Man. George Clarke follows the owners on this epic journey of restoring this beautiful oast house. Service rating : Very good service from start to finish. Product : Amazing place in beautiful countryside for a special celebration - so much so we had two weekends there within a month of each other. House is very well looked after and has everything you need. Would recommend 100%. Thank you for your kind comment on the service you received during your stay with us. We hope to be seeing you again soon! Wow what an amazing place. Absolutely stunning location and house. It's massive and has so much of everything, perfect for a girls weekend. The owner is lovely and very helpful. Would definitely recommended booking! Thank you for us all! Service rating : I stayed here with a group of 20 people for a friends birthday weekend celebrations. The place was absolutely amazing - really spacious, clean, modern, fully equipped, warm and welcoming! The surroundings we also great - some of us even managed to leave the comfort of the lovely house and venture out for a country walk in the surrounding area! This place is great for group weekend breaks / week long breaks - friends of family. I highly recommend it. Product : I stayed here with a group of 20 people for a friends birthday weekend celebrations. The place was absolutely amazing - really spacious, clean, modern, fully equipped, warm and welcoming! The surroundings we also great - some of us even managed to leave the comfort of the lovely house and venture out for a country walk in the surrounding area! This place is great for group weekend breaks / week long breaks - friends of family. I highly recommend it. Thank you for leaving your feedback on your stay at Finchcocks Oast, we are delighted to found the house as welcoming as we do! The surrounding countryside is wonderful, the whole experience is a real break away from stresses of modern life. We do hope to be able to welcome you back for another break away soon. "The Oast house was amazing and everyone was so impressed!" "We had another great week at the Oast and would love to come back again next year if you’d be happy to accept the same group (as far as we know) returning on similar terms." "We had a fantastic weekend. The Oast house is stunning. We had seen the George Clarke programmed on television so it was great to see the real thing. We had a surprise party for my husband who is still overwhelmed by the whole thing." "Thank you! My daughter and her friends had a wonderful time." "Just to say thank you for our stay at Finchcocks. It truly is a beautiful place and we thoroughly enjoyed ourselves." "Thanks again. Everyone loved the property and we will be returning next year!" "Excellent property with a high end finish and all the facilities required for large groups." "Had my 30th birthday at Finchcocks Oast and it was amazing! Best weekend ever! The place is beautiful and every detail has been thought out perfectly. Highly recommended! THANK YOU!" "Finchcocks Oast was utterly beautiful, and we were so very impressed at the standard of amenities/equipment and sundries provided. 5* accommodation." "We had an amazing time and thought it was a fantastic place to stay. Our whole family wanted to stay and hope to visit again! Many thanks!" "We were extremely happy with the house and the service around it." "Property was outstanding , do not think your photos did it justice, the property was finished to a very high standard and would book this accommodation again at the drop of a hat." 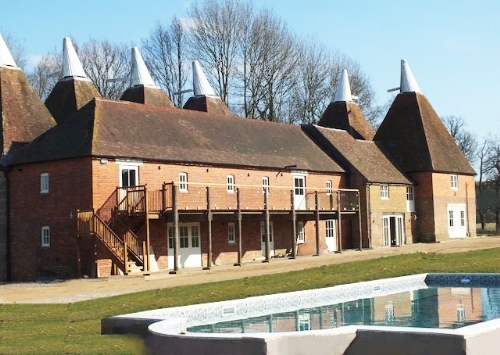 "We had an amazing time at Finchcocks Oast - The Kilns and would thoroughly recommend it. We especially appreciated prompt assistance at the property from the caretaker next to site." "The property was amazing!!! Everything was very efficient. Keep up the good work!" 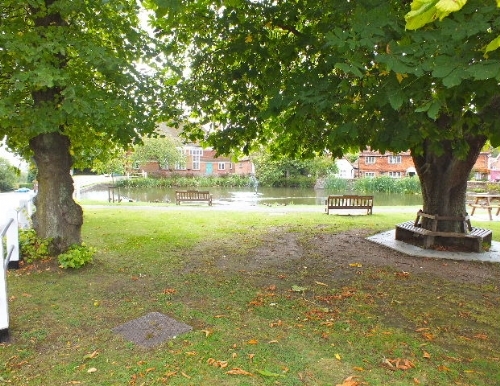 Situated on the edge of Goudhurst with it's pretty Victorian cottages, village pond and ducks. Visit the Music Museum in the fine Georgian manor house Finchcocks and pop in for a hearty lunch at the local. Finchcocks Oast 1-22: 7 bedrooms on the ground floor, 5 double and 2 twin bedrooms, the remaining 2 double bedrooms located on the first floor. For additional sleeping, each bedroom also has either a sofa (double) bed or a (double) day bed. Each bedroom has its own en-suite bathroom or shower room. Please consider how you wish the beds to be made-up to agree the make-up and number in your group. Kitchen, equipped with a gas range and ovens, separate electric ovens (4 ovens in total), domestic dishwasher, fridge and drinks cooler-cabinet. Large utility room houses a commercial dishwasher, washing machine, tumble dryer, microwave and a second large fridge with freezer compartments. Guests are requested to keep noise to a minimum between the hours of 11pm - 9am. All amplified music is forbidden.